RALLY YOUR FRIENDS FOR A TRULY IRISH EXPERIENCE! This year we’re going bigger and better than ever with exciting new entertainment, food & activities for the young and the young at heart. KINGSWOOD (festival regulars at Splendour In The Grass, Falls Festival and Groovin’ The Moo) will perform LIVE. There is also a stellar line up Irish rock and folk bands, Irish pipe bands and traditional dancers, PLUS stay around for the Laser Light Spectaular at 7pm that will light up the night sky in a haze of green! There’s four NEW zones to explore this year – Paddyfest Central, O’Donoghue’s Ale House, Little Leprechauns Kids Zone, and Food & Wine Lane. Click through to our Program page to read more about what’s on offer in these zones. Don’t forget to dress up in your favourite Irish couture – think green hats, green shirts, green everything – as we crown the Best Dressed Lad or Lass of Paddyfest (psst! there’s prizes *and glory* up for grabs)! Well colour me emerald, with this much to see & do, there’s simply no better place to celebrate the luck o’ the Irish than Paddyfest 2019! Don’t be green with envy – secure your tickets now to ensure you don’t miss all the entertainment on offer. We can’t wait to see you there! Need more information? Click here to read our FAQs section! 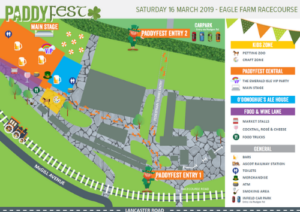 A General Admission ticket gives you access to all of the public activities at Paddyfest including Paddyfest Central, Little Leprechauns Kids Zone (see below for Kids Tickets) and Food & Wine Lane. Enjoy access to pop-up bars, some of Brisbane’s tastiest food trucks and live music all day and the massive Laser Light Show at 7pm! BRC Members & Guest Card holders have free entry to Paddyfest. Connections House (Level 2, Members’ Reserve) will be operating as a Phantom Raceday and open to Members & Guest Card Holders only. Member Gate Opening Time: As the first race (Flemington) is scheduled for 11.40am, Members have an exclusive entry at from 11.30am. Is your name Patrick or Patricia? In the spirit of St Patrick, all Patrick’s and Patricia’s receive FREE Entry to Paddyfest and a FREE beer on arrival! Simply show your ID to the Gate Staff to claim. *Offer is applicable for first names only. No tickets will be issued prior to the event. ID to be shown at entry on the day. Drink voucher will be issued at the gate upon entry. Offer is applicable to patrons ages 18+. Shake your shamrock and brace your festival boots for The Emerald Isle VIP Party at Paddyfest! Positioned adjacent to Paddyfest Central, escape the crowds while taking in the live main stage bands and roving entertainers from this unique outdoor space. You can expect a day of good beer with the comfort of your exclusive VIP area, featuring some traditional Irish bites and great craic. * Bookings essential. Not available on the day. There’s so much for kids to enjoy at Paddyfest. Grab a Kids Admission ticket (only available on the day – no pre-purchase available) and gain unlimited access to the Little Leprechauns Kids Zone and live entertainment all day including the Laser Light Spectacular at 7pm – an epic show not to be missed! PRICE: $5 per child (available on the day only – not available for pre-purchase). Children under 2 are free. ^ Children must be accompanied by a parent or guardian, and must be registered at the Main Gates and required to wear an Under 18 wristband for identification. Child tickets cannot be pre-purchased and must be arranged on the day.